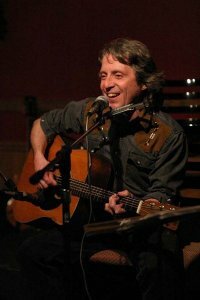 Friday February 26 at 8.00 p.m.
James Gordon is never at a loss for a lyric. Famous for having written a thousand songs and as a “go-to guy” when a local organization or your national broadcaster needs topic-specific music, James is the one they count on to deliver the appropriate message. James is donating all proceeds from the concert to the Guelph Civic League in support of their upcoming ‘Vote Guelph!’ campaign for this year’s municipal election. If you’d like to join the Vote Guelph team, email info@guelphcivicleague.ca or phone 519-780-5030. Celebrate the season at this first-ever collaborative event with all your favourite green-minded, socially conscious organisations. Enjoy complimentary appetizers and grooves by DJ Dino. 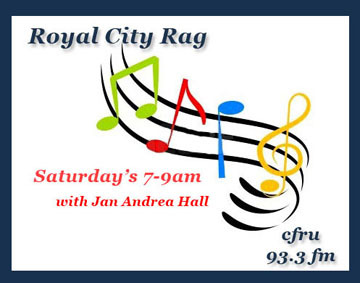 We were back on air with a busy Royal City Rag on December 5. Apologies to all our faithful listeners for being missing in action this past two weeks. In the first hour of the show, Annie O’Donoghue, President of the Guelph Civic League joined us to chat about the current municipal budgeting process and some suggested improvements that would allow citizens to feel more involved in the decision making process. She also reminded everyone about their opportunity to hear Mayor Farbridge deliver her State of the City address at 10 Carden Street on December 10 at 5.30 p.m. A question and answer session will follow her presentation. In the second hour we played some powerful audio from the Friends of the Royal City Park Community Tree Vigil that took place on December 4. On November 23, Guelph City Council approved an Operations Dept. 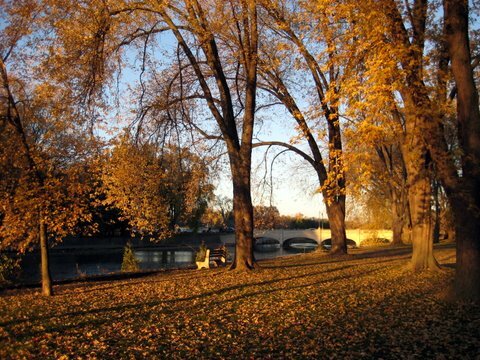 plan to remove 52 mature trees from Royal City Park. The removal of the trees, including some of the heritage veteran silver maples, and the potential for the loss of 5-7 more trees per year for the next 20 years will permanently alter the character and beauty of the park. 35 people attended the vigil to commemorate the trees and talk about how they will be personally affected by the avoidable loss of yet more of our green heritage. Guelph Urban Forest Friends have long been advocating for our urban trees, including a stronger protective tree bylaw and a separate urban forestry department with a certified forester to more effectively manage tree maintenance and coordinate public education on the value of our mature trees. For more information on GUFF, visit their website at www.guffguelph.ca. Later in the hour we talked to Simon Irving, Artistic Director of the Guelph Symphony Orchestra about their upcoming holiday season performances; The Snowman on December 13 and Dreams of Vienna on January 1. Tickets for both shows are available from the River Run Centre. We’re back on air with a busy Royal City Rag on December 5. Apologies to all our faithful listeners for being missing in action this past two weeks. It’s budget season at City Hall. After receiving citizen delegations regarding the budget for 2010 on December 8, city council will vote on the final budget for the city on December 15. In the first hour of the show, Annie O’Donoghue, President of the Guelph Civic League will join us to chat about the current municipal budgetting process and some suggested improvements that would allow citizens to feel more involved in the decision making process. In the second hour we’ll be talking to Simon Irving, Artistic Director of the Guelph Symphony Orchestra about their upcoming holiday season performances. We’ll also be playing some audio from the Friends of the Royal City Park tree vigil that took place on December 4. Should be a fun show. Join us on Saturday 7-9 a.m. on CFRU93.3fm or after the fact via the website. 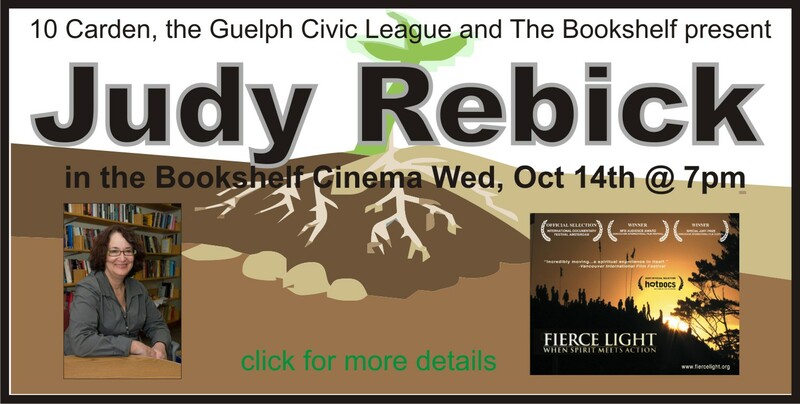 Judy Rebick is coming to town on October 14 to introduce the award-winning film Fierce Light and to do a ‘Guelph-launch’ of her latest book, “Transforming Power”. The event is co-hosted by Guelph Civic League, The Bookshelf and 10 Carden with guest Judy Rebick. Judy will introduce the film “Fierce Light” at 7.00 p.m. and then launch “Transforming Power” at a reception in the Green Room. The Guelph Civic League’s grassroots values campaign is featured in Judy’s book. She was also the keynote speaker at GCL’s 2008 conference “Communities in Action”. Members of the Guelph Civic League executive will also discuss ways for people to get involved in the year leading up to our next municipal election while 10 Carden will celebrate its imminent incorporation as an independent not-for-profit supporting social change. Wednesday, October 14 at 7.00 p.m. Doors open at 6:30. In the wake of the occupation of the land slated to become the Hanlon Creek Businesss Park (HCBP) and the ensuing injunction hearings I contacted a variety of Guelph civic and environmental organizations. I did not contact the organization known as LIMITS nor did I speak to the occupants themselves. In both cases, their positions seemed self-evident. They want the construction of the business park to be permanently deep-sixed. I did however contact local Sierra Club representative Judy Martin, the Guelph Chapter of the Council of Canadians (CoC-Guelph) and the Guelph Civic League (GCL). Co-Chair Norah Chaloner (with Dave Sills) responded for the CoC-Guelph as did President Annie O’Donoghue on behalf of the GCL. None of these organizations expressed support for the occupation. Chaloner and Martin were also united in the view that both the Minister of Natural Resources, Donna Cansfield and Mayor Karen Farbridge should accept the conclusions of the MNR’s Guelph District office and stop work until appropriate investigation of the Jefferson Salamnder issue could be conducted. Looking to the future, on August 17, Annie O’Donoghue stated, “GCL’s position is to urge the city to bring all community stakeholders together to seek a collaborative solution to the issues surrounding HCBP.” The GCL has continued to take this approach. The bottom-line is five community organizations have significant concerns with the situation as it now stands and the plans for the HCBP in there present form. Even a group such as the GCL that believes “the Hanlon Creek Business Park has the potential to strengthen our economy and increase job opportunities while protecting the environment” has concerns. The mayor firmly rejected any further dialogue. Repeatedly, throughout August, I contacted various members of the Green Party requesting information or answers. They simply refused to reply or respond. Subsequently, I informed the leader’s executive assistant, Debra Eindiguer that it seemed unusual to defer to a group that refused to comment. She assured me that a statement from the local Greens would be forthcoming early in the week of September 21-25. There is an elephant in the living room folks. It is Green. It is confused… and it is very long-winded. The Guelph Civic League is challenging the Mayor and City to reopen the dialogue regarding the proposed Hanlon Creek Business Park development. The City attended a Guelph Civic League facilitated session with concerned community groups on March 26 yet there has been very little dialogue since. So much for the Guelph Civic League being… as one person who wrote to me put it… “the Farbridge Party“. Kudos to them for taking a stand. Many citizens contacted the Guelph Civic League this summer to express concerns regarding the city’s handling of two development projects: the Guelph Youth Music Centre parking lot upgrade and the Hanlon Creek Business Park. We realize the two are very different in scope and complexity, but hope to draw your attention to the engagement practices as they relate to the concerns and subsequent outcomes. We commend Coun. 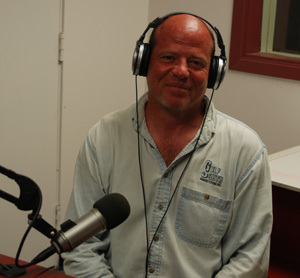 Ian Findlay for his leadership related to the youth music centre. As the ward representative, he intervened once citizens raised the alarm about an absence of real public process. Findlay listened, then supported both local and city-wide input to reduce the environmental impact of the project. We also commend the city staff and Farbridge for publicly acknowledging that a mistake had been made with respect to the process. Finally, we applaud the swift response in bringing staff and community stakeholders together to share information and develop solutions. We hope this can serve as a successful model for future developments. The Hanlon Creek Business Park process has not been as smooth. Despite the original public engagement and Ontario Municipal Board processes, community concerns began coming to our attention in late 2008 and have steadily increased. There seems to be significant frustration among various stakeholders surrounding this project exacerbated by recent acts of alleged “intimidation,” vandalism, civil disobedience and property damage. Most recently, citizens have expressed concerns relating to the nature of the city’s responses and the tone of city communications. There appears to be a general lack of clarity regarding the obstacles or avenues for change available, once a development has been passed by council, tendered and awarded. •As a community we share a responsibility to strike a balance between a strong environment and a strong economy. We appreciate the efforts of city staff and council, respect the parameters of democratic process and applaud our local environmental groups for their ongoing stewardship and advocacy. We believe, given the nature of ongoing concerns, the extent of misunderstanding and a growing sense of distrust and frustration by all parties, further action is required before the Hanlon Creek Business Park work recommences in the spring. We would like to invite Farbridge to re-engage the community within a collaborative process that addresses any legitimate citizen concerns and reinstates community cohesion. This is not about going over old ground but rather moving forward — seeking solutions where possible and developing better clarity, accountability and understanding around process and decisions. The Guelph Civic League would be happy to convene a small meeting (between the league’s executive, Farbridge and council representatives) at 10 Carden St. to explore this and/or any thoughts you may have regarding next steps. If all parties remain committed to a spirit of openness, compromise and mutual respect, we can achieve the same success for the Hanlon Creek Business Park as was demonstrated by the Guelph Youth Music Centre stakeholders. We are counting on the mayor’s leadership to make a difference. For more on this issue, catch Royal City Rag, Saturdays 7-9 a.m. on CFRU 93.3fm.